The magnitude 6.3 jolt struck the city of 350,000 during the bustling noon hour, sending many buildings tumbling and people rushing into the streets. The earthquake was the second to hit Christchurch, located on the east coast of New Zealand’s South Island, since Sept. 4. A magnitude 7.1 temblor shook the region then. Rescue workers worked around the clock to dig out survivors trapped in the rubble and recover bodies of those who died. Authorities expected the death toll to rise. In addition to the Cathedral of the Blessed Sacrament, several of the city’s historic churches were damaged or destroyed. 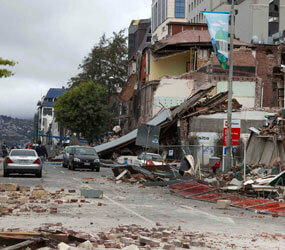 Among them was the iconic Anglican ChristChurch Cathedral in the city center, which lost its 200-foot steeple. Christchurch Bishop Barry P. Jones told the NZ Catholic newspaper that diocesan headquarters was “out of action” and that he was relying on a cell phone for communications with diocesan staff. “So I’m not in a position to get information,” he said. Messages of condolence and offers of help poured into the nation 1,400 miles southeast of Australia. Pope Benedict XVI sent a telegram to Bishop Jones in which he expressed his condolences to the families that lost loved ones. Archbishop Philip Wilson, president of the Australian Catholic Bishops’ Conference, extended “heartfelt thoughts” in a letter to Bishop Barry. “The proximity of our countries and the solidarity we share in times of disaster lead us to feel enormous grief for what your people are experience,” Archbishop Wilson wrote. Bishop-designate Charles Drennan, Blessed Sacrament cathedral administrator and diocesan chancellor, said engineers determined soon after the earthquake that it was unlikely that the historic church could be saved. The cathedral was undergoing repairs sustained in the September quake when the second temblor hit. Construction workers escaped, as did a custodian who was inside the cathedral. Two bell towers at the front of the building collapsed, bringing down much of the cathedral’s front façade. Major cracking around the cathedral’s main dome also was evident, said Bishop-designate Drennan, who was named coadjutor bishop of Palmerston North Diocese Feb. 22 by Pope Benedict. The cathedral’s stained glass windows, which survived the first earthquake and some 4,000 aftershocks since, are “in ruins,” he said. Priests at the cathedral rectory took shelter under a table when the earthquake struck, but one was able to see a tower collapse through a window. Bishop-designate Drennan praised the actions of older students at nearby Catholic Cathedral College who built temporary shelters for younger students terrified by the quake. The children, from St. Paul’s School, in suburban Dallington, were forced to relocate to Catholic Cathedral College, a secondary school, after their school was destroyed in the September earthquake.